This utility works on any version of Windows starting from Windows 2000 and up to Windows 8. You don't have to install Skype in order to use this utility. You only need the original log files created by skype, even if they are on an external drive. Fixed SkypeLogView to work while Skype is running. Added new actions: Voicemails and chats. Added 'Copy Selected Messages' option (Ctrl+M) - Copy only the messages of all selected items. Fixed bug: SkypeLogView crashed when exporting long chat message to html file. Added Duration Display Format option: HH:MM:SS, Seconds, Minutes, or Hours. Fixed a problem with /SaveDirect command-line option. Added 'Stop' menu item which allows you to stop the loading process of the Skype logs. SkypeLogView now loads the log items much faster and with less memory usage, especially if you have a large amount of items in the log. Added support for SMS messages. Added 'Show Select Folder On Start' option. When it's turned on, the 'Select Skype Logs Folder' window appears on the screen before loading the logs of Skype, so you can choose the correct folder and/or choose a specific date/time range. Fixed bug: SkypeLogView failed to load the log file if the path contained non-English characters. When you use the SaveDirect mode, the log lines of Skype are saved directly to the disk, without loading them into the memory first. This means that you can save a list with large amount of log lines into your disk without any memory problem, as long as you have enough disk space to store the saved file. The drawback of this mode: You cannot sort the log lines according to the column you choose with /sort command-line option. The date/time range is now saved in the config file. Version 1.10 - Added support for the new 'main.db' that is created and used by Skype 4. When this file is detected, SkypeLogView automatically loads the logs from this file instead of the old .dbb files. Version 1.06 - Added error message when Skype locks the log files. Version 1.05 - Added filter by action type (In Options menu). Skype Log files are stored under C:\Documents and Settings\[Profile Name]\Application Data\Skype\[Skype User]. In Windows Vista and 2008, the log files are stored under C:\Documents and Settings\[Profile Name]\AppData\Roaming\Skype\[Skype User]. If Skype is installed on your system, SkypeLogView automatically detect the last used account, and loads the logs from it. You can select to view the logs of another account by using the "Select Logs Folder" option. When Skype is opened, it also locks the logs file. before using SkypeLogView, you should close Skype completely. For calls and file transfers, the 'User Name' and 'Display Name' columns always display the user in the other side. As opposed to calls and file transfers, in chat messages these columns always display the the user that sent the message. This means that if you are the one that sent the message, you'll see your own name in these columns. For chat messages, the ChatID column is identical for all messages in the same chat session. The duration column is only displayed for incoming/outgoing calls. Also, for calls tries that have been failed, the duration column won't display any value. /UseTimeRange <0 | 1> 0 = Load all records. 1 = Load only records according to the specified date/time range. SkypeLogView.exe /UseTimeRange 1 /FromTime "22-06-2011 10:40:17" /ToTime "25-07-2011 14:20:10"
/stext <Filename> Save the list of all log items into a regular text file. /stab <Filename> Save the list of all log items into a tab-delimited text file. /scomma <Filename> Save the list of all log items into a comma-delimited text file. /stabular <Filename> Save the list of all log items into a tabular text file. /shtml <Filename> Save the list of all log items into HTML file (Horizontal). /sverhtml <Filename> Save the list of all log items into HTML file (Vertical). /sxml <Filename> Save the list of all log items to XML file. /logsfolder <Logs Folder> Start SkypeLogView with the specified logs folder. You can also specify the main.db filename instead of the log folder. /sort <column> This command-line option can be used with other save options for sorting by the desired column. If you don't specify this option, the list is sorted according to the last sort that you made from the user interface. The <column> parameter can specify the column index (0 for the first column, 1 for the second column, and so on) or the name of the column, like "Record Number" and "Action Time". You can specify the '~' prefix character (e.g: "~User Name") if you want to sort in descending order. You can put multiple /sort in the command-line if you want to sort by multiple columns. A file named SkypeLogView_lng.ini will be created in the folder of SkypeLogView utility. After you finish the translation, Run SkypeLogView, and all translated strings will be loaded from the language file. If you want to run SkypeLogView without the translation, simply rename the language file, or move it to another folder. 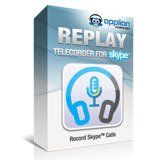 SkypeLogView is also available in other languages. In order to change the language of SkypeLogView, download the appropriate language zip file, extract the 'skypelogview_lng.ini', and put it in the same folder that you Installed SkypeLogView utility.